On another hand - doing electrical work on your own is one of the dumbest ways to die! And NEVER, EVER, EVER install lights yourself in a condo or apartment building, office, or another commercial facility. It is illegal, it threatens not only your family but the lives of all inhabitants in the building. If caught, you would be fined, brought to court, you would forfeit your insurance and face other terrible consequences for just installing a single light! No problem. This expert electrician in Toronto is extremely good and fast with troubleshooting and can fix most problems like the above within 30 minutes. There are four side by side switches and five cables inside the four gang switch box. First cable goes to corridor light, 2nd to wall mount light, 3rd to outdoor porch fixture, 4th connects a high ceiling hallway chandelier. I am not sure about the 5th one. Each cable consists of the white, black and ground wires. I decided to replace all four switches with a modern decora rectangle ones. I disconnected the old switches and now I do not know how to hook up the wires back correctly. Too bad you did not mark the wires and did not take pictures before disconnecting. There are two ways to wire a light and its switch. One method is when a power source or HOT cable is at fixture's ceiling junction box. Second option is when the feeding or HOT cable is in the switch box. This is by far the most common option and if you are lucky, it could be a rather simple fix. BTW, the 5th cable in the box is a HOT one. You can find the hot cable using a simplest possible handmade tester - a socket with two wires and a good working light bulb in it. First test it on the working wall outlet and make sure it lights up. Then, go to a panel and turn the power off. Assuming you deranged all wires in the switch box, make sure you separated all the black (Bl) & white (Wh) wires and that there are five single white and five single black conductors in the switch box. Grab all whites and twist their bare ends together with pliers.You will apply a large wire nut a bit later. Next, spread all 5 Bl wires apart. Naked Bl tips of should neither touch each other, nor touch the bunch of naked twisted together Wh tips, nor the box, nor touch the ground conductors. Go to the panel and turn the power on. Using the handmade tester carefully touch its Bl wire to the naked tip of Bl wire of the first cable and at the same time touch tester's WH wire to the bare tip of WH wires. Repeat this with every Bl conductor until the bulb lights up. The working light bulb indicates the feeding or HOT Bl wire. Shut the power off and clearly mark the HOT conductor you have just found. This Bl conductor belongs to the incoming power supply cable. Take the tester and touch its Bl wire to the naked tip of the Bl HOT wire and at the same time touch tester's WH wire to the bare tip of any of the four remaining Bl wires. The tester's bulb will light up or glow. One of these: corridor light, wall mount light, laundry room light or a hallway chandelier will light up or glow too. Note it. Put a small wire nut on the single HOT Bl wire, then mark the first Bl outgoing wire accordingly as, say, corridor light. Remove the wire nut and repeat steps outlined in this paragraph with each of the three remaining Bl wires, marking each of them with the name of the corresponding fixture location. 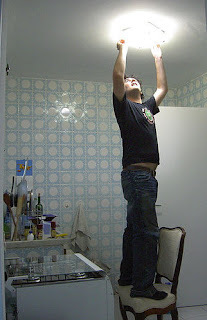 NOTE: these instructions will only work if all fixtures have at least one good working bulb. Now you can organize Bl ends in the order from left to right in the switch box according to the order from left to right and physical location of your lights. Make four Bl pigtail wires 6" to 10" long, strip naked 3/4" of insulation from each end, add the black HOT wire you have found before and twist the 5 Bl wire tips together with pliers. Apply one large wire nut to a bunch of Bl wires and another to a bunch of Wh wires. You now have four feeding or HOT pigtail wires. And there are four single Bl wires each identified as belonging to a different outgoing cable and light fixture. Take first single pole switch that has only two screw terminals and hold it near the left edge of the four gang switch box. Position the switch vertically so that its two contact screws are on its right hand side. Take a Bl pigtail, bend and wrap its tip directly under the head of a lower contact screw and tighten it firmly. Similarly, take the Bl outgoing marked conductor that you would like to be on the left hand side of the four-switch box and attach its bare tip to the top contact screw of the first switch. Take second single pole switch and hold it next to and to the right of the first switch (it would occupy a second left hand side spot). Position the 2nd switch so that its two contact screws are on its right hand side. Take a second Bl pigtail and wrap it directly under the head of a lower contact screw and tighten it. Similarly, take the Bl outgoing wire that you would like to be second on the left hand side and tightly attach it to the top contact screw of the second switch. Repeat these steps two more times. Spread the switches and make sure neither wires, nor screws touch each other, nor the box. Visually check your work for any defects or extra wires that are not connected to anything, etc. Then go to the panel and turn the power on. Test the switches one by one without touching any bare conductors or screws with your fingers. And make sure no bare tips or screws touch each other. If a dimmer-switch is needed, do NOT install it before testing all four switches. Replace switches with dimmer-switches AFTER everything was tested and working as expected. Why? Because if you shorted a switch, breaker would trip and probably nothing bad would happen. If you shorted a dimmer-switch, it would burn out wasting $25 to $40 in an instant. Do not try to do this if there was a red coloured insulation in the switch box. And stop experimenting if one (or more) of the switches was originally connected to a Wh or red wire(s), meaning that power source or HOT cable was at that fixture's junction box. Red colour could also indicate a presence of three way switch. And DIY work could become much more complicated than described above. Never forget that doing electrical work on your own is one of the dumbest ways to die or lose your home to fire! Comments with outgoing links will NOT be published!